CLEANER’S TESTIMONIES “Cutting down on shopping would mean one meal a day” BRING OUR CLEANING STAFF BACK IN HOUSE NOW! 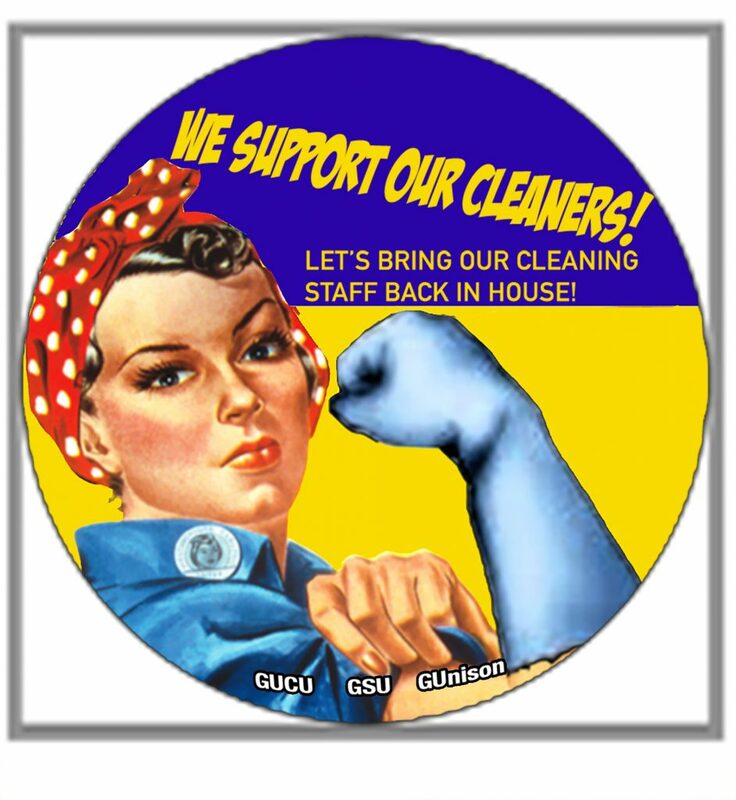 Read these testimonies from our cleaning staff at Goldsmiths collected by their union UNISON and WEEP. This is how the staff who keep our college clean every day are being treated and how they will be affected by changes being proposed by private employer ISS. Read these testimonies and SUPPORT our cleaners. Read these testimonies and get ORGANISED behind their campaign – LETS BRING OUR CLEANING STAFF BACK IN HOUSE. My family is in Africa, I have to send money every week so if you give me the 8 hours or 4 hours I still have to pay rent £450 per month. I think the easiest way is to leave this job. ISS they don’t appreciate. Am not happy at all with their decision. Am waiting for the final day and say bye bye. God bless you. The change is going to affect my income. This will lead to failure to fulfill my financial obligations. It is going to affect my time with family since I only have between 19.00 to 22.00 to be with them. I cant continue servicing my mortgage with little salary. Transport from work at midnight is almost impossible. How can I feel about it??? Shame we all gonna lose half our wages. Take £600 a month, that is not gonna be enough for me, and the bad thing is I’m a woman and it’s not safe for me to leave home at midnight. I’m expecting a child so I have to leave on maternity, so I am working saving some money for my baby. I wish them all the best but they have to think of us, of our budget and our family. Thank you. I feel very demoralised as is my only source of income. This change will drastically affect my wages as I will lose 15 hours per week. Having an overall effect on my expenditure for my home. I have a daughter that I support and family overseas. I feel so bad. I’m not happy about the changes because it is the only job I have. I lose £612 a month. To and from work the travel expenses I will spend £102 monthly. I have my father and mother who live in Africa as well. It is going to affect the rent because the pay is lower. I wont be able to pay the rent. It is also going to affect weekly shopping because the pay is lower I might not be able to pay for food and clothes for the family. The changes make my life hell and depressed. I am going to lose £700. Travel card expense to and from work costs me £98. No childcare. I support my three children back home (overseas). It will affect my family here badly. I can’t afford rent and bills with this change. Weekly shopping will be difficult. Lose about £600 a month. Spend £81.50 a month on transport. Childcare – will have to look for someone to take them and pick them up to look after them. I don’t feel content about the recent changes. As a single mother taking care of three children the time changes would prevent me from taking care of my children; abandoning them would be heart breaking for both me and them. Additionally the time changes can be quite dangerous as the night crime rates in South East London are high. Without their mother, my children would possibly be sent back to my hometown. So I need this job. I support my mother back home, plus my rent is extremely expensive (£1,300). The change in the hours could force me to quit, doing so would make me and my children homeless. So please think with your heart not your brain! I took this job because it fitted into my daily life. Now the change means it will affect my family life, child-care and travel. I am on the morning shift and I also do care for my disabled sister. I have been working over 10 years and I feel energetic to come in the morning – changing the shift pattern will cost me more in travel after work and bills. It’s really bad. Because of the starting time and finishing time. Travel in the night is expensive and dangerous. Paying more for child care – because I support them every month. The change is going to affect my family, my rent and bills. My life will change and this is going to be a problem for my health. So I say NO. Thank you. I am unhappy about the proposed changes in working hours, the changes will affect my personal life negatively. Working less hours in the proposed change will mean a reduced income for myself. This coupled with household costs and housing costs will mean I lose the ability to pay my mortgage and affect how much money I can spend on my childcare. I am unable to choose any of the shifts (working hours) advertised as I have children, my husband only works nights so I am unable to work evenings. This will make life very difficult for my family. I hope these changes are reconsidered, as they will have a grave impact on my family and its quality of life and comfort. I am worrying about these changes because I will lose 15 hours per week which is like £105 a week. My rent and my bills take more than half of my wage, with this situation, I do not know if I will be able to pay rent and bills on time and help my family overseas. My weekly shopping will also be affected because I will not have enough money to buy what I usually buy for my house. My future is in doubt and I start already to look for another job to survive. First of all there is nothing that I am going to gain, rather I will be losing as my wages will go down by almost 50%. These wages won’t even be enough to cover even my monthly rent. Hence my household will suffer. The four hour suggested shift starting at 20:00 hours – 00:00 hours will have impact on my childcare, as I will have to spend on childcare as my wife comes home at 22:00 Monday – Friday. The loss of wages will not be enough to cover bills and rent. It will not be feasible for me to come to work for fours hours as wages will be spent on transport. I do not agree with the change. How much money I will lose will be £600 plus. What will with the overtime hours? I have two children to support. Some of my family back home in my country rely on me helping them each month £300. My rent will be affected. I will have to move to find a cheaper area – not easy in London. Cutting down on shopping this would mean one meal a day. For me I don’t agree at all. I feel it’s betrayed my hard work. I will lose out about six hundred pounds. It will be hard for me to travel to work because I have a family to look after putting food on the table. I would have to cut off my family overseas. My rent will be affected – will be hard to pay. I would have to move. Shopping I would have to cut down on groceries. I am saying “no” to the change in working hours because it will affect my life in different ways. I have small children, so me and my wife have to create a schedule in order for us to be at home with the children. My wife works in the afternoon so she takes care of the children in the morning and I spend the afternoon with them. So if my working hours will change it will affect my life as my children will have to stay alone at home. Bills and rent and shopping – £2,400 so working hours will be inconvenient for us and we will struggle financially. I disagree with this because of the emotional and discriminational stress involved. I have been treated very badly with no consultation or information about this autocratic imposing of the restructure. I had to change my shift to suit my family – my partner who works days and I work nights. That enables us to care for our children. Financially this is going to paralyse my family both here and abroad because any house rent and transport cost a lot not including bills. When we had the restructure just last year it took us over six months to think and get over it, but this present administration thinks so low of us and believe we don’t have rights, but I would like ISS to know that even animals have rights. I totally disagree with the impartial test system which people took again and again with applicants supervising applicants. This has bought sadness into my family and this is affecting my kids and partner. Changes affect me due to the time in that I can’t make it because I take children to school. If you change it even the transport will be more difficult at night as they are not running in the normal time as during the day time. If you change hours it is also going to be a problem to my family which will be affected because of me doing 7 hours a day. Thinking being a single parent, my children will be affected in a way that their demands, ambitions will not be fulfilled. For instance clothing, shopping, accommodating them, outings to take them for fun etc. My entire family will also be affected because I have got extended family and always support them by sending them money for sustenance. Commuting from home to my workplace, I use the train, which is expensive. Therefore when the working hours are reduced, I wont be able to cover the transport cost too.